Just because you don’t have much of a yard doesn’t mean you can’t have a nice little garden going! Rubbermaid storage containers are lightweight and just the right size to get you started. Fill the bottom with packing peanuts and a layer of garden fabric to keep them easy to move. This could even work on a small apartment balcony! Diapers aren’t just for doo doo! Place one in the bottom of a potted plant to help it retain moisture for longer. This would be great for those summer annuals that require daily watering. 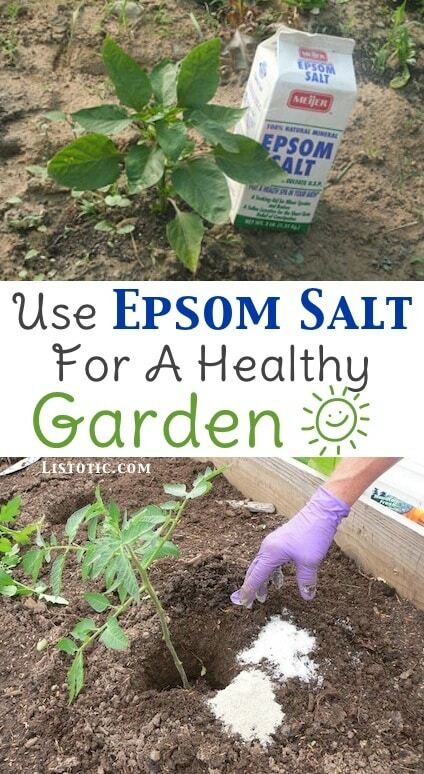 Epsom salt has so many uses, including aiding in a beautiful and healthy garden. It’s rich in magnesium and sulfate which are crucial to plant life. For potted plants, mix a couple of tablespoons of the salt into your watering can once or twice a month. You can also sprinkle it in your garden’s soil to help your seeds germinate better. Tomatoes and peppers benefit the most because they both tend to have a magnesium deficiency. Add a tablespoon or so in with the soil when first planting, and then sprinkle more into the soil once mature.